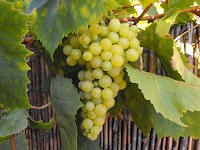 In questa fotografia, ci sono uve (plural for "uva - pronounced with a soft "a" ) per vino bianco (for white wine). I started growing grapes two years ago. Much like Wisteria, it takes a two years to see the fruits of your efforts and in this case I mean that literally. This lovely cluster is hanging lazily over my fence made from, coincidentally, vigne di uve (grape vines).